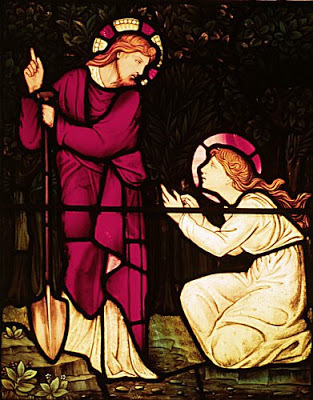 Mary Magdalene and the Gardener. Once upon an Eastertide, a little boy came home singing the Pete Seeger song: “Inch by inch, row by row, Lord, please help my garden grow”. At school the little boy, along with his class, had planted bean seeds in jelly jars. Each day they’d tended their little glass gardens, checking the moist dark earth. Some of the children drowned their seeds with love. While others, their seeds withered from neglect. While others, theirs actually and miraculously sprouted and grew. It wasn’t exactly “Now the green blade riseth” but it was sweet indeed. That sweet little boy was my son Jacob (now 27 years old!). Sadly the little Jesus vine did not survive very long — but don’t blame Jacob. Sadly, you see, plants often came home to my house to die. When I was growing up, reading my mom was like reading a weather report. Is today’s forecast dark and stormy? Bright and sunny? Clear and calm? My mother could lash out like lightning just as easily as she could erupt in joy. Her highs and lows were beyond her control, tamed only by a regular shot of bourbon, a little lithium, and the occasional session with Dr. Freud. My beloved mom did the best she could. Categories: Spirituality and Mental Health | Tags: "Inch by Inch, "Now the green blade riseth", bipolar disorder, Dirt Therapy, Easter, gardening, Mary of Magdala, mental health, Mothers and Daughters, Row by Row", spirituality | Permalink.